Ed: This month we’ve got two reviews of a book which has stirred up a lot of debate among feminists in the last few weeks. I’m facing a feminist dilemma. A few weeks ago, I agreed to review a book for this site, a book written by a friend and ally of mine, a woman I deeply respect. 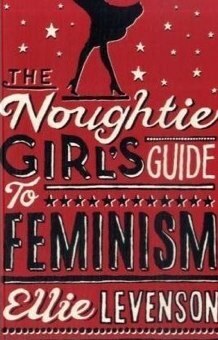 The Noughtie Girl’s Guide to Feminism by Ellie Levenson is an attempt to merge the type of froth-feminism peddled by Cosmopolitan and Glamour into something more meaningful and coherent. It’s a flouncily inoffensive go-to guide for the type of modern woman who likes the idea of self-respect and empowerment but is frightened that feminist politics comes with a mandatory buzz-cut, all wrapped up in a kitsch pink cover with the ubiquitous pair of disembodied stillettoed legs that screams “whatever this is it’s disguised as chick-lit!” Unfortunately, the disguise works a little too well. Petty arson aside, the real heartbreak of Noughtie Girls is that both the concept and execution are so very spot on. I adore the fluffy, frilly presentation, the demotic language, the stubborn refusal to get bogged down in high theory, which has its place, but not in an introductory book for sceptical feminists. I love the way the whole thing is structured in bitesize crossheads, making it easy to open at any page and find something interesting. I even like the silly little Cosmo-esque “what kind of feminist are you?” quiz at the front of the book, which shaves gleefully close to self-parody. It’s perfect Tube-reading. It’s fun. It’s accessible. It’s the sort of thing that I might give my little sister for Christmas, sandwiched between something smelly from The Body Shop. But here’s the rub: it apologises too damn much. The book comes across as an apology for a brand of ‘man-bashing, bra-burning’ feminism that never really existed. It spends altogether too much time dismantling the straw woman of the feminist who would forbid pretty young ladies from waxing their legs and wearing pink, and altogether too little time explaining why it is that that sort of feminist only exists in the nightmare fantasy Britain conjured up by editors at the Daily Mail. It spends so much time debunking the myth, telling its readers that it’s okay to be a ‘Noughtie Girl’ who likes high heels and pink drinks, that it ends up reinforcing the idea that ‘traditional’ feminism is something to fight against.